The Picerne Family Foundation created The Educational Visions Program to encourage the development of exciting and impactful educational programs in elementary, middle and high schools. The goal of the program is to enhance the student’s education as well as to provide stimulus to the teacher’s professional career. The Foundation invites highly accomplished and motivated educators of any discipline to propose “the education project of their dreams”, a program that they would love to create in their school. The Foundation’s role is to provide the funding to help the teacher fulfill that dream. The Foundation provides multi-year grants and organizational consultation in support of the program. Funding is only provided for programs that fall outside of the scope and responsibility of education district budgets. Grants are currently awarded to school teachers in Orange County, California. Eastbluff & North Coast Elementary Music Program. The Picerne Family Foundation awarded the first Educational visions grant to the Corona del Mar (CdM) High School Vocal Music Program, led by Andrew Ball, Choral Conductor, for the 2017/18 school year. The goal of the program is to develop the musicianship and vocal ability of the most capable students by providing access to individualized voice lessons. All 41 members of the top choral group, the Madrigal Singers, are eligible for weekly 30-minute individual voice lessons throughout the school year. In addition to inspiring a culture of musicians who value both solo and ensemble performance at the school, Mr. Ball hopes to broaden the discussion and raise expectations about what an academically focused high school music program must include to properly prepare students for university level programs. 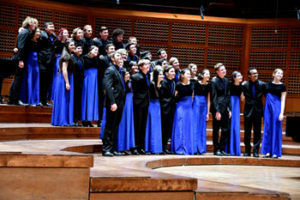 Long term success would see most of these students continuing to create music at high levels throughout the country, not just as high-ranking university voice majors, but also as participants in top collegiate and community vocal ensembles. Regardless of each student’s ultimate career path, they will be lifelong participants in music and the arts as performers, audience members, and patrons. They will take with them experiences that will enrich themselves and those around them. To measure outcomes of the program, students receiving lessons will be tested using six-level sight reading tests. Vocal improvement will be determined in individual and group performances where participants are provided direct feedback from adjudicators who are masters in the field. The impact of the program will also be measured by the number of students who receive scholarships or admission into top music schools. Laura Erath, a Southern California performer and vocal coach, will assist Mr. Ball with leadership of the expanded vocal music program and will provide the individual vocal coaching. Andrew Ball - Choral Director. Andrew holds a BA in music and a Teaching Credential from the University of California, Irvine, and is working to obtain a Masters of Performance in Choral Conducting from the California State University at Fullerton, where he is in his second year. During his education, Andrew has had the privilege to study with notable conductors such as Professor Joseph Huszti, Dr. Stephen Tucker at UCI, Professor Christopher Gravis, Dr. Robert Istad and Dr. Chris Peterson. Andrew Ball is currently based at Corona del Mar High School, where he is the Director of Vocal Music and conductor of the Corona del Mar Madrigal Singers. He has also been assisting with the direction of choirs at the University of California Irvine since 2008, where is currently a conductor of the University BATS Chorus, and functions as the Choir Director at Harbor Christian Church, where he has conducted since 2009. In addition to his time teaching, Andrew performed with the UCI Men in Blaque from 2010 through the summer of 2014, with whom he participated in many festivals and competitions in multiple countries such as China, South Korea, Mexico, and Slovakia. He made his international debut as a conductor at the Bratislava Youth Festival in the summer of 2014, where he conducted the UCI University Choir, and received a Golden Band and Winner of the Musica Sacra a cappella Category. Andrew is currently singing with the CSUF University Singers under the baton of Professor Christopher Gravis and Dr. Robert Istad, with whom he traveled to Paris in Summer of 2015. When not singing or conducting, Andrew enjoys geocaching, ultimate frisbee, and super hero movies. He fancies himself a bit of an eccentric, and Maurice, his puppet, agrees. Laura Erath is both a performer and vocal coach throughout Southern California. Laura received her BFA in Vocal Music with a specialization in Opera from the University of California, Irvine. Laura has been trained in both musical theater and classical voice and has been performing in both genres for more than a decade, with her most recent production at the Irvine Barclay Theater in May, where she played the role of Mrs. Webb in Ned Rorem’s operatic rendition of the classic play, Our Town. In addition to her work as the PAMA vocal coach at CDM, Laura manages a private studio of her own students in both San Diego and Orange County, is the alto section leader at St. Thomas Moore Catholic Parish in Tustin, and is the associate vocal director of Peter Pan Junior Theater and Chook Theater, youth theater organizations that serve 4th-12th graders in San Diego. In addition to being involved in over 25 fully staged productions throughout Southern California, she has been the featured alto soloist in Mozart’s Regina Coeli with UC Irvine’s top chamber ensemble, has performed solo sets in the American Art Song Alliance series, and reprised the role of Orfeo in an encore production of the concert version of Gluck’s Orfeo ed Euridice in conjunction with the UC Irvine symphony orchestra. Laura has competed in choral competitions and performed throughout Europe and South Africa, placing 1st in multiple mixed chamber choir categories at the International Youth Music Festival in Bratislava, Slovakia. She has performed classical selections in master classes for notable musicians, such as mezzo-soprano Janet Hopkins and mezzo soprano, Dame Felicity Palmer. Laura has provided vocals for over 30 radio jingles in San Diego County and has been televised on KPBS as a featured singer in the One World One Dream ensemble, which celebrated heroes within the San Diego community. Laura’s life is enriched by music and she feels lucky to share her experience and love of this craft with her students on a daily basis! The Picerne Family Foundation Educational Visions Grant was awarded to the Eastbluff and Newport Coast Elementary School music programs for the 2018/19 school year. Technology in the Musical Classroom, led by Rebecca Herron, will increase student’s musical literacy and foundational musical knowledge through the use of technological resources, specifically iPads and music education applications. The musical classroom is often overlooked when new technology is brought to an elementary school site. Engaging students with technology in addition to traditional teaching methods fosters creativity and inspires appreciation for the musical art form on various levels. Including singing, playing, composing, listening, and digital music production. Ms. Herron also hopes to lay the foundation for students to further their musical education and establish an appreciation for music that continues throughout students’ junior high, high school and beyond. Rebecca Herron began her musical studies at 4 years old. During her education she has had the opportunity to travel and play in various venues across the United States, including Perl Harbor and Carnegie Hall. She has participated in various festivals and competitions such as the Percussive Arts Society International Conference and the American String Teachers Association’s National Orchestra Festival. Rebecca has performed with a variety of ensembles including the Pepperdine Symphony Orchestra. Rebecca is currently based at Newport Coast Elementary and Eastbluff Elementary where she is a musical specialist and directs several string ensembles. Additionally, Rebecca has worked with the Newport Mesa Summer Music Academy where she has taught students in an intensive summer music program that develops instrumental skills in students with no prior musical knowledge and furthers development for higher level learning in students with playing experience.